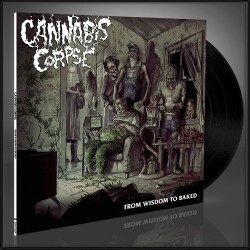 Richmond's weed-obsessed death-dealers CANNABIS CORPSE unleash their new full-length album 'From Wisdom to Baked'. 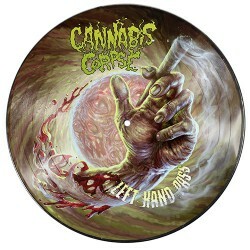 The trio, including MUNICIPAL WASTE bassist/IRON REAGAN guitarist Landphil and former GWAR guitarist Brent Legion, fuse influences from the halcyon days Florida death metal into a brutal, modern US death metal attack. 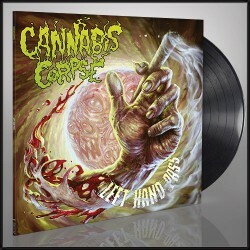 Punishing new tracks like "Zero Weed Tolerance", "Individual Pot Patterns", "Baptized in Bud", and "THC Crystal Mountain" are nothing short of killer metal, giving voice to insane stories of marijuana zombies, arcane pot lore and demented hillbilly cannabis farmers. 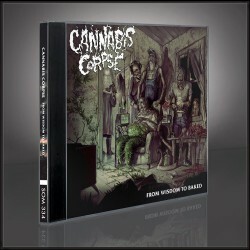 Featuring CANNABIS CORPSE's most powerful songs to date, and guest appearances from Chris Barnes (SIX FEET UNDER), Trevor Strnad (THE BLACK DAHLIA MURDER), Digestor (GHOUL) and more, 'From Wisdom to Baked' is undoubtedly one of 2014's best death metal albums.